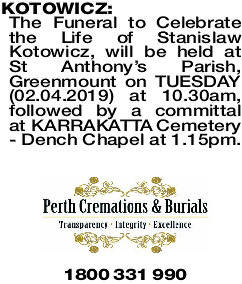 KOTOWICZ STANISLAW Much loved Husband of Maria, Stepdad to Mariola, Ryszard, Irena, Ania i Kasia. Much loved father-in-law to Dean, Kris, Peter, Greg i Kamili. Dziadzius to Emila, Dorota, Patryk, Lukasz, Arek, Max, Natalia, Daniel, Alex i Nikos. Stasiu cherished us all and we loved him beyond words.